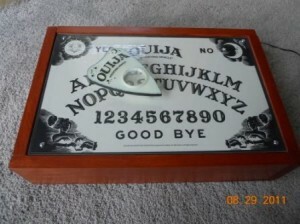 Ok, I’ve seen a couple of animated Ouija boards on the net, but DaveintheGrave from the HalloweenForum has the most detailed tutorial on how to make this prop I’ve ever seen. 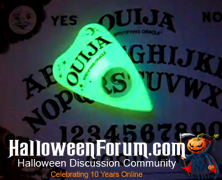 It’s broken down into two parts, with Part 1 focusing on how to prep the box that will house the guts of the Ouija board prop, while Part 2 details the mechanics of the prop. DaveintheGrave utilizes a small vent motor for this prop, and breaks down the motor instructions into two additional tutorials for further clarity (Motor Part1, Motor Part2). There is a link to the video of this prop in action at the beginning of Part 1 of the tutorial, and as you will see, this prop is worth the time spent making it, it looks amazing.